Costume designer Maria Marrero, a professor of theater design and technology in the College of Visual and Performing Arts’ (VPA) Department of Drama, will present “Character & Collaboration,” a retrospective of her career in theatrical costume design, Sept. 25-Oct. 14 at 914Works, 914 E. Genesee St., Syracuse. The exhibition, which will include costumes and sketches, is presented in recognition of Hispanic Heritage Month. It is free and open to the public. A closing reception will be held on Tuesday, Oct. 14, from 6-8 p.m.
Marrero has taught at Syracuse University for more than 30 years. She has designed costumes for productions at leading professional and regional theaters throughout the United States, including the Apollo Theater in Chicago, Actors Theater of Louisville, the Berkshire Theater Festival, Burt Reynolds Jupiter Theater, Delaware Theater Company, ESIPA “the Egg” in Albany, Playmakers Repertory Theater, Florida Studio Theater, Indiana Repertory Theater, Rochester’s GEVA Theater and Buffalo Studio Arena, the Vineyard Theater and the Baroque Opera Company in New York City. Marrero has designed regional and national tours, including the premiere production of “Handy Dandy” and “Of Mice and Men.” She was a founding member and resident costumer/designer of the second Florida State Regional Theater, Players State Theater at Miami’s Coconut Grove Playhouse. Her designs for “A Flea in Her Ear” won the Best Costume Design award from the Miami Critics Circle. Her designs for “Life with Father”and for “A Christmas Carol,” both at the Coconut Grove, were nominated for Carbonell Awards in the category of Best Costume Design. 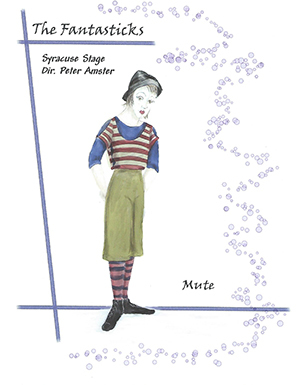 The resident costumer/designer at Syracuse Stage for 12 years, Marrero designed costumes for 36 productions, including “Putting It Together”and “The Fantasticks.” She was a draper at Eaves-Brooks Costume Company in New York City and has worked on film and television projects for PBS and independent companies. 914Works is an intimate space for VPA students and faculty to present individual or group exhibitions, readings and small-scale performances. Gallery hours are Tuesday-Saturday, 10 a.m.-6 p.m. The gallery will be open from 10 a.m.-8 p.m. on Third Thursdays (Th3) of each month. For more information, contact 914works@syr.edu.